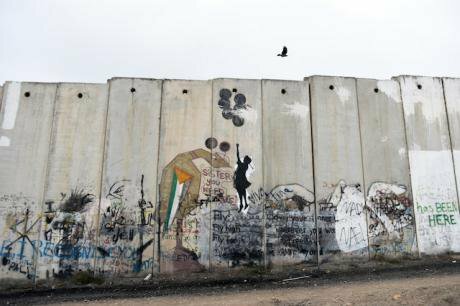 Girl with balloons by Bansky on the Israeli West Bank wall at the Qalandiya checkpoint, north of Jerusalem, Sunday, Dec.,2016. Mick Tsikas/Press Association. All rights reserved. The World Health Organization (WHO) has recognised mental health as an essential component of health since 1946. Yet, around the world, mental wellbeing is an underfunded, under-resourced and largely misunderstood area of health provision. In extreme environments such as war, the detrimental impact on civilian’s mental health is one of the most significant consequences. Following recent events in Gaza and with the Israel-Palestine conflict now in its seventieth year, Palestinian’s need for adequate mental health services is a growing imperative. Over fifty years of occupation enforced by the Israeli Defense Force (IDF) has exposed Palestinians to perpetual traumatic events including humiliation, imprisonment of youth, torture, house demolitions, land confiscation, movement restrictions and unemployment. These routine human rights abuses are continual and pervasive. From apartheid road systems and checkpoints, to settlements and of course the wall, the psychological stress incurred by the occupation has left the population with one of the highest rates of mental health disorders in the Middle East. Mental health workers across Palestine treat a variety of symptoms that have manifested as a result of the occupation. Israel has not fulfilled its international legal obligation as an occupier to implement its own mental health act, leaving protocols as the responsibility of individual psychiatrists, who are limited in number. In the West Bank, just twenty-two are trained professionals. Unsurprisingly, trauma and anxiety prevail as the most prominent effects of living in the occupied Palestinian territories (oPt), with women and children suffering disproportionately from mental health disorders. In Gaza, suicide rates have soared – grassroots NGO We Are Not Numbers (WANN) noting 80 suicides per month in January and February 2016, an increase of 160 per cent compared to previous years. For Palestinians, trauma is not a past event – it is growing up in a continued traumatic environment with no end in sight and thus individual diagnoses such as post-traumatic stress disorder (PTSD) do not fit within the Palestinian context. In fact, placing such labels on victims within this special context can do more harm than good. Individual diagnoses strip individuals of their context and in the Palestinian case vitally exclude the narratives of violation and injustice. Hunaida Iseed, Director of the Guidance and Training Centre for the Child and Family (GTC), believes the normalisation of Palestinians’ experience of trauma in itself has negatively impacted the mental health field. Iseed reports on the lack of commercial interest in funding trauma and PTSD research because of the extent that it has become an accepted part of everyday life in Palestine. Mental health professionals depict the challenges they face within the unique complex socio-political context of the occupation. The narrative of violation and injustice emerges as integral to the development of diagnosis. The clinical director of Bethlehem’s only mental hospital Dr Ivona Amleh for instance, is currently guiding a transition from a traditional medical model to one based more on recovery and empowerment – which incorporates the way power and oppression work; what she describes as ‘occupation therapy’. Dr Amleh asserts the need for mental health workers to be flexible, but shares the desire to shift towards specialising in order to provide better services. Humanitarian aid and development predominantly revolves around the basic physical needs of a vulnerable population. Societies have been slow to progress with mental health provision on a global-scale, and there is certainly a long road ahead before mental wellbeing is treated as importantly as physical. In Palestine, the deep US funding cuts to the United Nations Relief and Works Agency (UNRWA) has left the physical needs of Palestinians in dire short supply, but mental health services must not go unaddressed. Psychological care must be integrated into primary health care, so that professionals can specialise in the areas needed to treat psychological effects of the occupation. More international mental health professionals and institutions should partner with their Palestinian counterparts to help deliver effective care programmes. For as long as the occupation continues, Palestine’s health sector requires sustainable development support from the international community so as to ensure that vital infrastructure and services like local models of care are in place to better respond to all health challenges of the population in need.